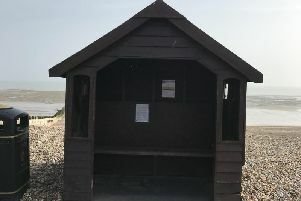 In a new statement, the Fishersgate Community Association (FCA) claimed it installed CCTV in public toilets at the community centre to catch vandals. But a spokesman for Adur District Council (ADC) said CCTV is ‘never appropriate within toilet washing areas’. Chairman of Fishersgate Association, Peter Averillo said he and a colleague have resorted to police protection after people made ‘slanderous remarks’ towards them on social media. He added that the police were consulted before the installation of CCTV cameras in the mens and women’s toilets, and only two people, both DBS checked, had access to the footage, which would only be reviewed in light of vandalism or drug use. On February 15, ADC took repossession of the centre due to ‘safeguarding concerns’, but Mr Averillo said the council ‘overreacted’ in its decision to do so. “The overreaction from ADC in their unnecessary closure of the centre has had a very negative impact on the community of Fishersgate and on all the regular groups/hirers of the premises. “Much inconvenience and distress has been caused,” he said. In response, a spokesman for ADC said the decision was ‘not taken lightly’. Since taking back the centre, the council said issue of CCTV in the toilets was brought to their attention. The spokesman continued: “Our view is that CCTV is never appropriate within toilet washing areas in a community centre. We have raised this issue formally with the Information Commissioner’s Office and are in discussions with them and FCAs legal representatives about this. Mr Averillo said the FCA will rebuild the reputation of the centre and the community once the building is back in its possession. “It’s a shame to see how much damage can be done to a community centre and the community in such a short space of time,” he added.